Together Bobby Rootveld (guitar, percussion and vocals) and Sanna van Elst (recorders and vocals) formed Duo NIHZ in 2001. This duo from The Netherlands is currently based in Germany. 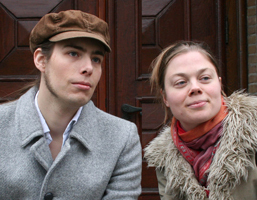 Next to the traditional classical repertoire Duo NIHZ specializes in music mixed with theatre and comedy, Klezmer, Yiddish songs, and the restauration of music composed during the Shoah. Numerous composers composed especially for Duo NIHZ including Nikita Koshkin, Richard Vaughan, Annette Kruisbrink, Gianmartino Maria Durighello, Fred Rootveld, Louis Ignatius Gall, Stefan Grasse, Jim ten Boske, Nutavut Ratanakarn and Jan Bijkerk. Duo NIHZ collaborates with other artists like storytellers (Loek Boer, Benjamin Stedler), guitarist Alberto Mesirca, chazan Baruch Chauskin and saxophonist Gergö Pazmandi. Duo NIHZ performed in numerous countries and on special location and festivals including: The Concertgebouw of Amsterdam, The Rundetaarn in Copenhagen, The Portugese Synagogue of Amsterdam, The Taj Concert Hall in Thimpu Bhutan, Kolkata Classical Guitar Festival in India, Thailand Guitar Festival in Bangkok, Mottola Guitar Festival in Italy, Jewish Galicia Museum in Krakow Poland and in numerous of other synagogues, churches and festivals and concerthalls in Holland, China, HongKong, Malaysia, Switzerland, Argentina, Germany, Israel, Greece, Denmark, Hungary, Italy, Slovakia, Poland, India, Bhutan, Thailand, England, France etc. Duo NIHZ released several cd’s and dvd’s. In 2009 Duo NIHZ received a special ‘Certificate of Acknowledgement’ during the International Jewish Music Festival of Amsterdam. In January 2011 Duo NIHZ opened it’s own concert hall in Nordhorn, Germany: www.kulturhausnihz.de . Kulturhaus NIHZ contains Europe’s biggest classical guitar library-and research archive including sheet-music, cd’s and lp’s. Bobby and Sanna are also the founders of the Guitar Festival Nordhorn, Gall Youth Guitar Festival and Recorder Festival Nordhorn. Bobby Rootveld also takes care of the musical legacy including compositions and the archive of the great late classical guitarist Maestro Louis Ignatius Gall. Bobby also used to be the chairman and is a founding member of the Twents Gitaar Festival (Netherlands) and the Valais Guitar Week (Switzerland). Duo NIHZ has an extremely strong connection to Jewish Music. Bobby’s grandfather was Jewish. He was the only surviving member of his family in the Shoah. This off course played a big part in the desire to play Jewish music. It is not just playing music, it is dedicating Duo NIHZ’ music to the Jewish history, the sunny and dark sides. Music is their way to get ‘in touch’ with their own background and honouring this background.